PHOTO BYSTEVE WILLIAMS Old Fort’s AJ Steyer drives to the basket as he draws contact from Josh Matz (24) and Braden Schaser Friday. OLD FORT — It has been a bit of a struggle for Old Fort the past month and sometimes there is a tendency to take corrective measures to extremes. The Stockaders did that on occasion here Friday night, but still got the desired result with an 88-48 win over Lakota. 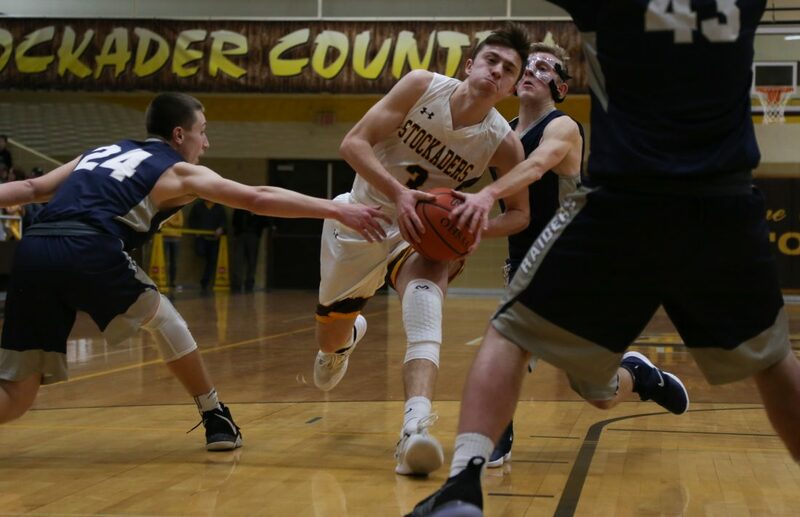 Old Fort, which has dropped three of its last five games and had to go to overtime to get one of the two wins, improved to 12-5 overall while retaining a share of the Sandusky Bay Conference River Division lead with Calvert at 10-1. The Stockaders had four players in double figures and knocked down 11 3-point attempts, but the process against the Raiders (1-17, 1-11) was a little slow in developing. Old Fort had edged out to a 10-6 lead despite six first-period turnovers and a 3-for-7 accounting at the foul line. But an 8-2 burst over the final 1:33 of the quarter got things rolling. Zach Dewese scored on a putback and added a 3-pointer before Weston Miller took a pass from Mason Salas and hit a 3 for an 18-8 lead at the break. The Stockaders did that in a big way in the second period, hitting 10 of 16 shots, four of them 3-pointers. They finished the quarter with a 20-6 run that put the game away at 49-24 by halftime. Six baskets over the final three minutes came with assists. “One of our goals was to have 10 assists at halftime,” Hoover said. “We wanted to make sure we were passing the ball around because you have to move the ball against a zone. Dewese led Old Fort with 22 points and seven rebounds. Miller had four 3-pointers on the way to 17 points, Carson Steyer added 13 and 6-foot-5 freshman Colin Nutter had 10 points and 10 rebounds in only his second start of the season. “We started him against Margaretta and he got into foul trouble and didn’t play a whole lot,” Hoover said of Nutter. “But he’s been doing well in practice and I thought he went in and did a pretty good job tonight. Meanwhile, the Raiders got 20 points from their point guards — 12 from Elijah Franks and eight from Braden Schaser. “We didn’t shoot real well and you cannot have a bad shooting night against this team,” Meade said. “But I liked our effort all night.